Nine citizen journalists from Nomad Green, the Rising Voices grantee in Mongolia visited Taiwan from 27th of April to 5th of May. 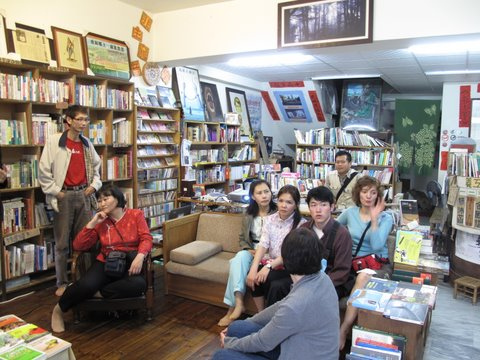 Portnoy of Nomad Green informs that the scope of the visit was to learn more about Taiwan's social and environmental issues and local cultures. During the tour they also received training in citizen media practices. They also interacted with Taiwanese citizen media contributors, activists, environmentalists, and the Mongolian community in Taiwan. The visit was sponsored by the Mongolian and Tibetan Affairs Commission. Although geographically far away, the island of Taiwan and Mongolia, the world's largest landlocked country, have maintained close relationship… now the two countries join in solidarity on environmental issues. The citizen journalists were overwhelmed by the experience and began writing in the Nomad Green Blog and a few of the articles were translated into English. Nine Nomadgreen civil journalists sat on the train from Ulaanbaatar to Zamyn Uud at 4PM of April 25, 2010. This was the start of our journey to Taiwan. Read here to learn about the exciting journey via train and bus through inner Mongolia to Beijing, missing the flight in Beijing and Hongkong and finally reaching Taipei. We are in Taiwan and everything is strange and interesting for us. Today is 30th of April in 2010. It is quarter past seven. We had a dinner with our Taiwanese friends and guides. Fortunately, we were united with Mr.Baatar Hai, Mongolian Tibetan Affairs Commission, and one Indonesian girl. She was adorable and cute. I wanted to take an interview from her, because she is a Indonesian I never met before. Read the interview of Neny, the Indonesian girl who talks about how she lost her parents during the 2004 tsunami. Yu Guo-xin and his companions first fought using tougher methods to preserve their historical heritage and failed to see better results. But they never gave up the effort and finally saw results by choosing a gentler, more peaceful method of protest. 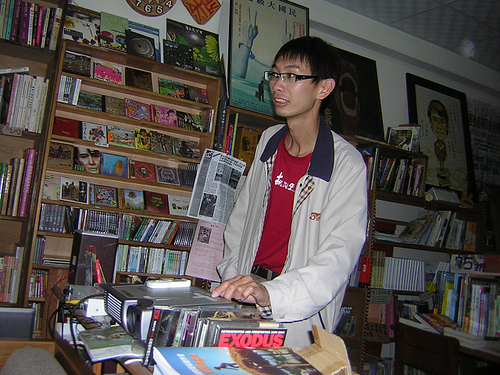 His bookstore used to be located at an old house which was once the home of a regular 20th century citizen. But the government issued a decision to bring down the building, replacing it with a new, modern standard hotel. After much thinking, Hun-Yang came up with an idea that would keep the old building intact. The plan was to explain and make them realize why it’s necessary to keep the old traditions and heritages. For example, they garner the public’s attention by operating bazaars and exhibitions that sell the citizens’ hand-made items, food and beverages, and hold small concerts and plays in those significant buildings and areas and then advertise the historical and cultural importance of those places to the visitors. Hence, not only was the aged house saved, people lent their hands to renovate it. Surrounded by fancy modern buildings, the old house stands , now a cafe, reminding people of how common citizens of the 1960’s lived and the importance of preserving history and tradition for the next generation. What an inspiring story! Read the rest here. Among other places the members of Nomad Green also visited the Shiao-Lin Village to learn about the devastation of the flood disaster last August and how Shiao-lin people stood up again. It was wonderful study tour for us. We still stay in touch each other and talk to ourselves even now. We talk about Taiwan a lot and do have a wish to travel again. Personally, i have a true willing to continue my contribution to Global Voice.